The Surface Go is a gorgeous machine that brings you an excellent Windows 10 experience in a 10-inch tablet. The Surface Go, Microsoft’s latest tablet that aims to be a smaller – and more attainable – Surface Pro has finally arrived. The Surface Go doesn’t bring any major surprises, but maybe that’s a good thing. With the Surface Go, Microsoft is showing everyone that the best Windows tablets can be affordable – everything you love about the Surface Pro 6, just smaller and more affordable. No half baked operating systems – though Windows 10 S Mode is enabled out of the box – and no strange app compatibility issues. The Surface Go works from the word “go”, which is why we love the Microsoft Surface brand. 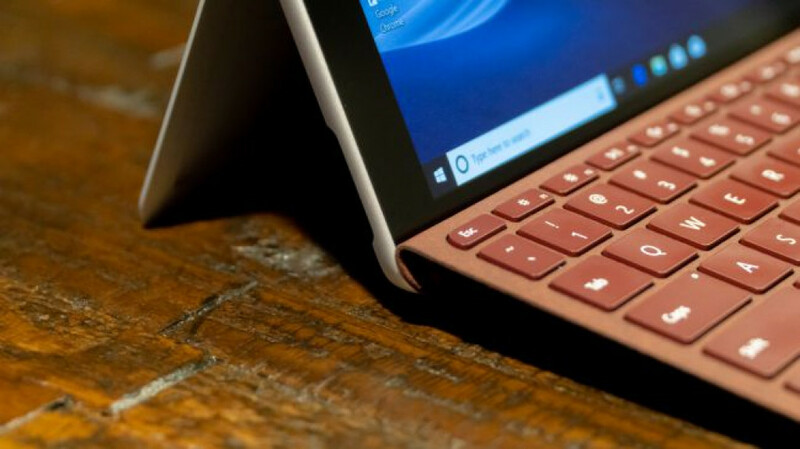 When you opt for a device as small as the Microsoft Surface Go, you’ll have to make some compromises, especially when it comes to power – though the rumored new Surface keyboards might help in the future. Still, the Microsoft Surface Go is what the Surface 3 should have been when way back then – but thankfully, the wait is over. Depending on what your workload looks like, the Surface Go might be the right for everything from work to consuming your favorite media. In the race for the ultimate tiny tablet for taskers, Microsoft knocked it out of the park with the Surface Go. The Surface Go configuration we reviewed here will set you back $549 (£509, AU$839, AED 2,399), and it’s the highest-end version of the tablet offered by Microsoft. Meanwhile, you can get the Surface Pro for as little as $399 (£379, AU$599, AED 1,699), with 64GB of eMMC storage and 4GB of memory, with the rest of the specs remain the same. Annoyingly, Microsoft continues to sell the tablet’s all-but-essential accessories separately. The Surface Pen goes for $99 (£99, AU$139), while the new Alcantara fabric Type Covers designed for Surface Go ask for $129 (£124.99, AU$199, AED 399). These come in burgundy, cobalt and platinum colors. 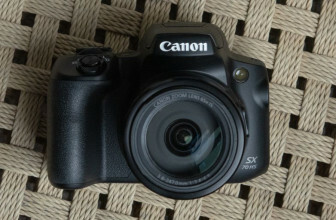 Finally, a standard black nylon Type Cover is available for a more palatable $99 (£99, AU$149), bringing all of the same features in a slightly less premium feel and look. The Surface Go’s biggest rival, Apple’s iPad 2018, starts at $329 (£319, AU$469, AED 1,349) to start, which gets you 32GB of flash storage and 2GB of memory – half as much as the starter Surface Go in either case, but with a sharper display. If you want the iPad to match the Surface Go in storage, the 64GB model will set you back $429 (£409, AU$599), though memory stays at 2GB in all configurations. If you’re after a Windows 10 device, there’s the Asus Transformer Mini, which is extremely similar to the Surface Go in that it offers a 10.1-inch Windows tablet with a kickstand. Plus, both the stylus and keyboard cover are included for just $399 (about £300, AU$534) to get the model with 128GB of storage. But, the display isn’t quite as good as either alternative, and it’s limited to 4GB of RAM as its only configuration. 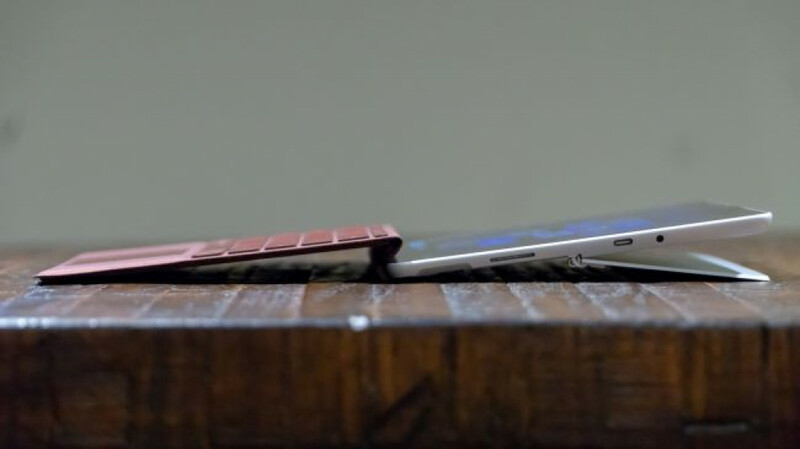 At first glance, the 1.15-pound (0.52kg) Surface Go appears simply to be the Surface Pro shrunken down by 2.3 inches on the diagonal, and that’s largely true – excellent kickstand and all. However, Microsoft clearly put some design effort into this version, opening it up to a larger audience, specifically students. 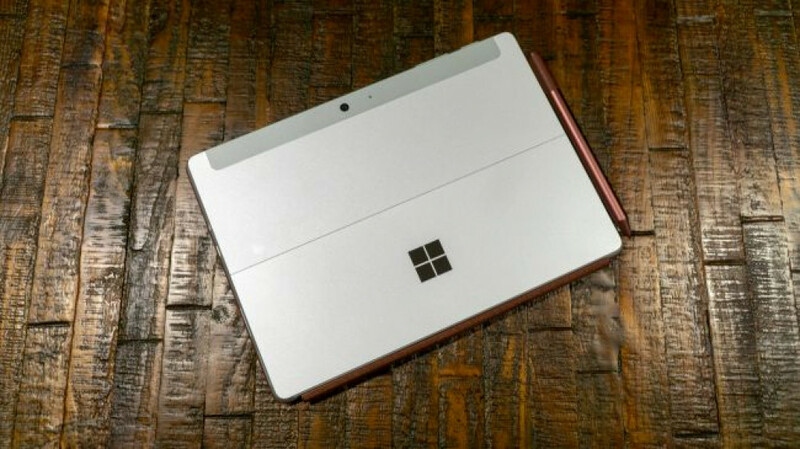 The first major hint toward the Surface Go’s intended audience is the rather prominent rounding of the edges and angles that Microsoft has applied to the device. Gone are the stark, angled edges of the Surface Pro in lieu of rounder, softer edges that help give this version of the Surface its own distinct identity. Beyond that, this device is largely the same in design as its forebears, except smaller. The excellent hinge returns and can bend nearly 180 degrees like before, making this device an ideal canvas for digital drawing and note taking. Microsoft still managed to cram a USB-C port and microSD card reader into the smaller Surface Go, neither of which the latest iPad has. This means that not only can this tablet’s storage be expanded, but it has two ways to hard-wire a dock and expand displays compared to the iPad’s single method, thanks to the mainstay Surface Connect port. As for the new, obviously smaller, Type Cover, Microsoft manages to deliver full-sized keys (now with more pronounced curves) within a smaller amount of space, and has included a glass trackpad that’s larger in depth than that of the Surface Pro. All told, the Type Cover feels just as snappy as it has before – we would say ‘only smaller,’ but it doesn’t feel that much more cramped when typing. That said, you will need to get used to a slightly tighter typing experience, especially when the device is on your lap. The keys are spaced closer together than normal keyboards, which alters exactly where your fingers naturally rest, so as to keep your index fingers on the F and J keys. Otherwise, typing on the Surface Go is much more comfortable than on other 10-inch devices, which should be lauded. For what it’s worth, the iPad Smart Keyboard uses strange, completely round, keys and doesn’t even feature a touchpad – because iOS doesn’t support mouse input. Microsoft’s display game continues to be top notch on the Surface Go. At 1,800 x 1,200 pixels, it’s not the sharpest 10-inch tablet display by a long shot, with the latest iPad coming in at 2,048 x 1,536 pixels. Still, though, the Microsoft Surface Go’s display is beautiful in everyday use. The display is extremely color accurate, and movies and photos look amazing on it. Of course, that 3:2 aspect ratio is great for work and web browsing, but gives full-screen 16:9 videos some wasted space with black bars. 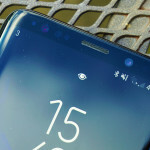 Like most tablets, the bezels around the screen are pretty large, but that just allows users to grip the device from any side without accidentally triggering anything on the screen. It also allows for the Type Cover to connect to the bottom bezel via magnet for a better typing angle. 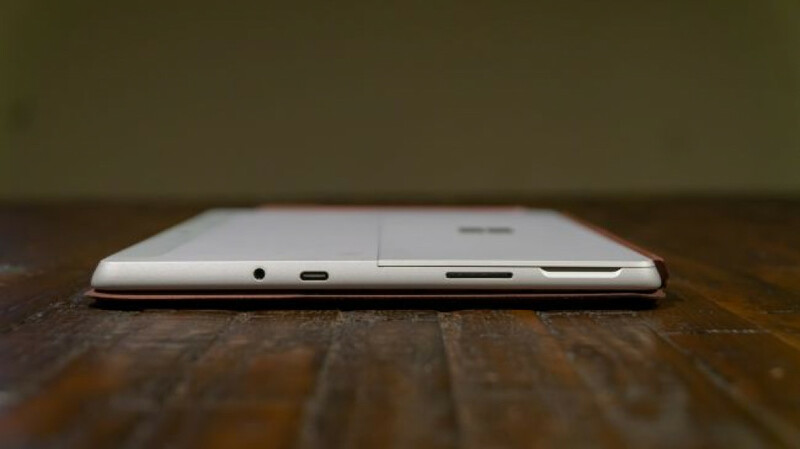 Regarding the relatively thick bezels, the Surface Go’s speakers reside within them on both sides of the screen. For such tiny drivers, these speakers sound surprisingly powerful, deep and nuanced in the amount of channel separation they can deliver. This makes the Surface Go just as good of a multimedia tablet as it does a mild productivity device. Before getting too deep into details just yet, let’s make it clear that you generally shouldn’t buy a tablet or laptop for this price and expect a powerhouse. 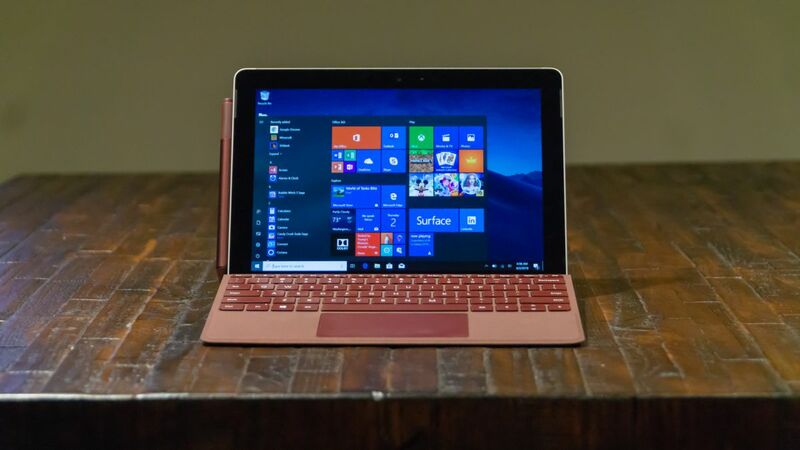 However, you should get something competent enough to handle basic workloads and casual games, and the Surface Go does exactly that – but not much more. The Surface Go, with its Intel Pentium Gold processor, can handle basic browser-based workloads, like word processing and content management, as well as the suite of Office 365 apps, with ease. With 8GB of RAM in the higher end model, you could even run several tabs-worth of projects and websites and media players. However, don’t expect this processor to handle high-resolution image or video editing and rendering in the same way that a proper laptop does. That’s not this tablet’s forte. That said, the CPU inside employs Intel’s HD Graphics 615, which isn’t far off from the integrated graphics inside the Intel processors used in gaming laptops. This allows for some surprisingly powerful 3D rendering on the Surface Go, to the point that Minecraft runs like a dream on the tablet. Furthermore, education apps that use 3D modeling – particularly in the science field – run without issue here, as does Microsoft’s own Paint 3D tools. Now, the Intel chip here isn’t all that comparable to the latest iPad’s A10 processor, as both were made with entirely different architectures and on different chipsets. Also, Apple literally designs its own chips to work the absolute best they can with iOS – Microsoft cannot do this to the same degree. So, yes, the iPad processor is more powerful than the Surface Go’s, but it’s an apples to oranges comparison. The iPad ousts the Surface Go in pure speed tests, like Geekbench 4, but the Surface Go is a far more versatile device – even in Windows 10 S Mode. Speaking of which, unless you’d like to keep your device on lockdown for security or simplicity reasons, just upgrade to Windows 10 Home for free once you get this device. The performance hit to the system with the overhead of full Windows 10 Home ranges anywhere from negligible to nonexistent. 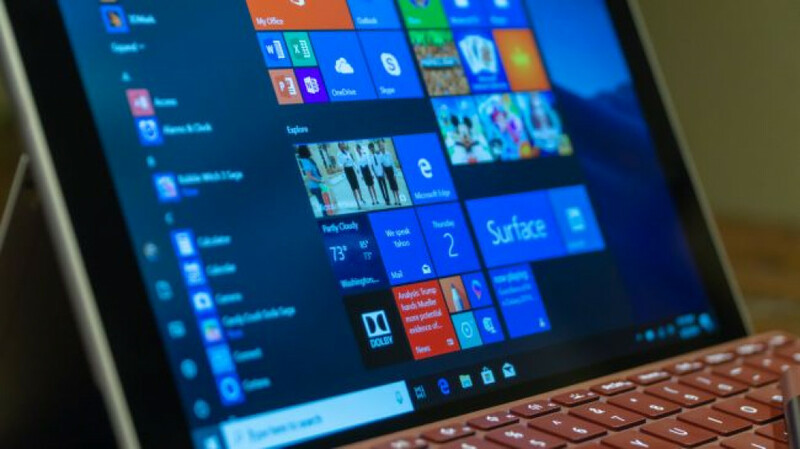 At that point, all that Windows 10 S Mode is giving you is peace of mind, which is easily found in Windows Defender and smarter web browsing habits. Microsoft promises up to 9 hours of continuous use from the Surface Go. Shocking no one, those aren’t the numbers we could reproduce in our testing, but they’re not awful. What’s weirder is how we’ve found the device to actually last longer in Windows 10 Home than in S Mode. The difference in our tests is less than an hour, and at any rate, expect the Surface Go to last around six hours on a charge, and perhaps a bit longer if the Battery Saver feature is used. 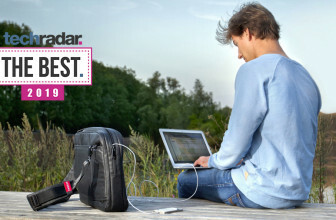 For folks in fields that are light on hardware requirements and heavy on travel, this device could be a go-to for you. Stay tuned as we test the battery even further in both modes of Windows 10. The Surface Go ships with Windows 10 in S Mode. 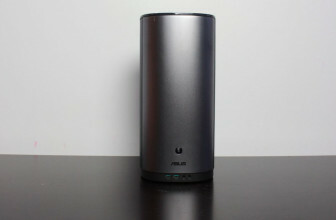 Because this device uses an Intel processor, however, this is largely fine for day-to-day use. While the app selection on the Microsoft Store is paltry in comparison to the software available to download from the internet, at least the device can run every app designed for Windows 10 natively without issue. Windows 10 devices with Qualcomm’s Snapdragon 835 chip installed can’t say the same, as their processor architectures aren’t compatible with how many Windows 10 apps were built. Windows 10 S might bring with it more security, but if you’re careful online (and have Windows Defender installed) you should be alright. The Surface Go doesn’t have many other standout features to speak of, but we especially appreciate facial recognition login via Windows Hello. While it doesn’t operate in the same way, Microsoft has essentially beat Apple to bringing hands-free, secure login to its tablet. 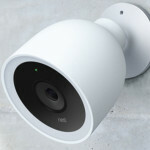 Microsoft’s implementation here works fantastically, which is buoyed by a very good 5MP webcam and 8MP camera on the rear. The webcam shoots 1080p video that’s crisp and detail-rich, making Surface Go also ideal for video meetings. For comparison’s sake, the iPad uses only a 720p FaceTime camera. The Surface Go may very well be a niche device, but it’s a niche that’s only growing. With every major hardware vendor focused on smaller productivity tablets, Microsoft has finally nailed the concept of the smaller Surface device, once again showing the world how it’s done. 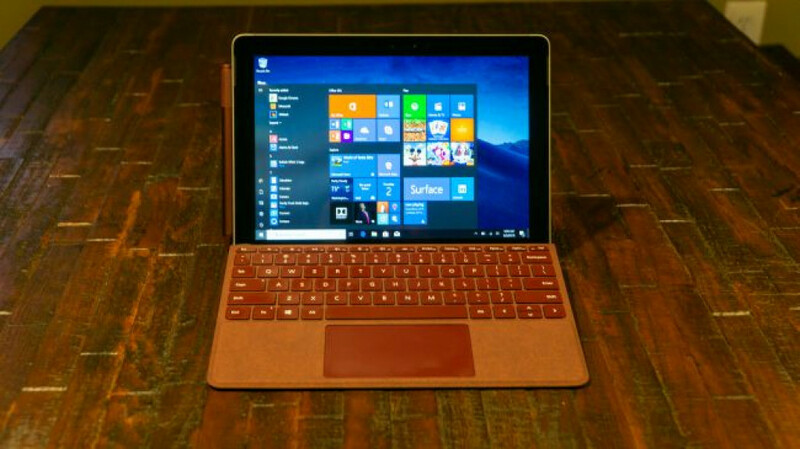 While you could reduce the Surface Go to being just a smaller Surface Pro, the truth of the matter is that the market is trending toward smaller and smaller computing devices. Now, the Surface Go is there to meet them with a full-blown, 10-inch computer. Of course, we could complain about how there are still no accessories included, that it’s technically less powerful than the new iPad and that the screen could be sharper, and they’re all valid complaints. However, if you’re looking at the new iPad or another 10-inch tablet to be your next primary computing device next to the Surface Go, or even a secondary gadget, it’s tough to beat this gorgeous machine that’s truly a computer in every sense of the word.